I loved that the author discusses water conservation and using invasive species and weeds in this book. The photography is absolutely beautiful and the subject matter inspiring. The one thing I wished was different was the lack of photos or examples for some of the projects / recommendations for botanical dyes. For example, passionflower, calendula, bougainvillea, wild fennel, and citrus peels are all mentioned as effective botanicals for dyeing, but the pages dedicated to those plants don't contain any photos of the color produced by them. There *is* a watercolor chart in the back of the book that attempts to replicate some of the colors that the plants produce, but based on how it represents some of the other plant dyes that I am familiar with, I'm not certain that the colors are completely accurate. (Not based on my own experience with plant dyes anyway - the colors in this palette don't seem entirely true to color to me.) It would have been nice to have had photo examples of fabrics that had actually been dyed with those plants. However, don't let the lack of photos for those projects deter you from picking up this title. It's packed with great information and is a really beautiful, inspiring book. 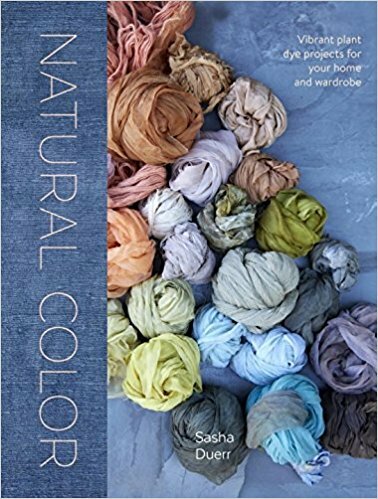 Recommended for anyone who is interested in a more natural way to dye their favorite textiles.